This past weekend we had the opportunity to stay in this lovely flat in Amanzimtoti, Durban. Yes, it was over the same weekend as the Curry Cup Final, but our team was out of the running, so did not bother me in the slightest. 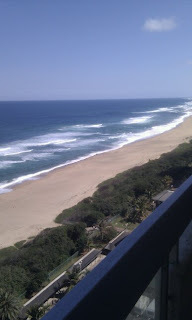 The flat is located right on the beach of Amanzimtoti and sleeps 6/7 people. It is on the 17th floor with a >180 degrees view of the Kwa Zulu Natal coastline. Fully furnished including bedding, microwave, fridge and box freezer, tumble dryer, TV & DSTV decoder. Secure basement parking and storage for trailers rounded of the stay. With a SPUR in the next block, and a Shoprite Checkers within walking distance, everything is right there. Amanzimtoti also offers a very good Funland which offers 10 pin bowling, games arcade, bumper cars and restaurant.